The ability to pass and feel comfortable in public places is uppermost in the minds of the vast majority of TG people. The presence of male pattern hair growth is by far the main stumbling block; the need to wear heavy make-up to disguise beard growth often drawing unwanted attention. The advent of laser hair removal brought hope to thousands, so why are there so many conflicting reports and why is constructive information so difficult to come by? How can we make sense of the different systems on offer? I’m Chris Hart an associate member of The Northern Concord and one of the most experienced laser therapists in the country. I’ve put together the following information exclusively for Cross Talk, tracing the history and theory behind the technology. I truly believe that the only way people seeking treatment can assess the capabilities of the many different systems on offer, is by understanding how laser hair removal works and the factors which effect the results. The effect of ruby laser light on hair growth was first discovered by Professor Marc Clement whilst conducting a scientific experiment in 1976. Professor Clement and his team decided to research the theory of using laser energy to prevent re-growth of hair in order to assist plastic surgeons in cases where the donor skin for re-constructive surgery was hirsute. The objective being to destroy the hair follicle without damage to the surrounding skin tissue. The laser Professor Clement developed is named The Chromos 694 Ruby Laser. After ethical clinical trials this laser was used in hospital environments, by plastic surgeons for several years before it came to the publics notice in the 'Tomorrows World' programme in 1995. Despite the ever increasing number of systems flooding the commercial sector The Chromos 694 remains the only system to be used to assist plastic surgeons treating patients who are undergoing reconstructive surgery. Before we can fully understand how laser hair removal works we need to look at the process of hair growth. On the surface of the skin all hair looks the same but the condition of the hair follicle is vitally important to the success of laser hair removal. The growth and shedding cycle of the hair follicle is divided into three phases. 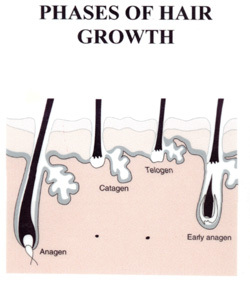 In the growing stage (anagen) the cells at the base of the hair follicle divide and form the new hair which is pushed upward and appears on the skin surface. Once the formation of the hair is complete the cells at the base of the follicle stop dividing and the follicle then moves into the next stage (catogen). The follicle continues to nourish the hair, which is still firmly attached. The final stage (telogen) occurs where the follicle no longer nourishes the hair, which in turn is shed. After a dormant period the hair follicle will spring back to life and the process is then renewed. The length of each of these stages varies in different body sites for example the follicles of the scalp remain in the anagen stage much longer than any other body site which is why our head hair grows long. It is only in the anagen stage that enough thermal damage can be done to the hair follicle thus destroying its capacity for re-growth. This coupled with fact that all of our hair follicles are not active at the same time explains why laser hair removal requires more than one treatment. Lasers work by producing an intense beam of bright light, which travels in one direction. Ordinary light from non-laser sources is composed of many different colours or wavelengths, and appears white, whilst a laser has the unique ability to produce one specific colour or wavelength. As each wavelength has different absorption properties with the skin, lasers are successfully used to target specific structures within the skin, without causing damage to surrounding tissue. Laser hair removal is based upon the technique known as "Selective photothermolysis" This is the principle of using laser energy to selectively destroy a target beneath the surface of the skin whilst leaving the surrounding healthy tissue intact. Ruby laser seeks to use the concentration of pigment (melanin) in the hair shaft to absorb the laser light, thereby heating the hair and causing thermal damage to the follicle whilst passing harmlessly through the other tissue components. 1. Wavelength - individual wavelengths have different effects on the skin tissue and on how the laser light is absorbed. The optimum wavelength for hair removal would be highly absorbed in the concentration of melanin in the hair shaft and transmitted harmlessly through the surrounding tissue. 2. Pulse Duration - this is the length of time the laser light is in contact with the skin. The heat must be maintained for long enough to destroy the hair growth mechanism, but not too long as to burn the skin. The ideal pulse duration required to generate the correct amount of heat in and around the hair follicle is approx. 1 millisecond. If the pulse duration is too short not enough heat will be generated to destroy the follicle. If the pulse duration is too long heat may dissipate into the surrounding skin increasing the risk of burns. 3. Energy density - This is the amount of energy required to prevent re-growth and must be between 10-25 joules per sq. Cm of skin. 1. The colour of the hair - there must be a concentration of colour in the hair to absorb the laser light. The treatment does not work on grey or blond hair. 2. The skin colour - there needs to be a minimum of colour in the skin. Coloured skin contains so much pigment that the laser light is absorbed in the skin and not the hair. 3. The hair - The hair needs to be just visible on the surface of the skin in order to indicate the position of the follicle. The shorter and more coarse the hair the better the treatment results. 4. Medication - some medications can cause photosensitivity of the skin, these include some antibiotics, blood pressure / heart tablets and Premarin. These medications do not exclude patients from treatments but a full list of medication should be asked for and disclosed by the patient to the treating clinician. Test shots are always advisable in order to gauge individual skin reaction. It appears that many clinics are somewhat evasive when asked the question "Is laser hair removal permanent?". Patients who took part in the clinical trials for the Chromos 694 Ruby Laser have remained hair free for at least 4 years. Most physicians consider that the chances of re-growth after this period are negligible, however for legal reasons the manufactures are unable to class the process as permanent at this moment in time, but refer to the process as long term. Beware of any clinic that claims otherwise. Costs of treatment vary from clinic to clinic and area to area. It should never be the main deciding factor and the most expensive need not always indicate the best. It is possible to find clinics that do not charge consultation fees and who will include free test shots in order to gauge skin reaction. Clinics should also breakdown treatments into facial areas at no extra charge in order to spread costs, for instance having your upper lip and chin treated first and then as finances allow, moving onto other facial areas. laser clinician. The certificate of registration and the clinicians training certificate must by law be displayed in the clinic. Never go to an unregistered clinic. The next step is to telephone the clinic concerned and ask as many questions as you feel relevant. Is the clinic health authority registered? Which laser is in use? What wavelength does the laser use and how does it interact with the skin? What are the pulse duration and energy density? Are consultations and test patches free? Who will carry out the treatment? Does the clinic set aside special times to treat TG / TV clients? Will you be made welcome? Ask for a brochure and if you are happy with all of the facts make an appointment for a consultation. You are bound to feel vulnerable and a little self conscious as this is a very personal issue. It is important that you have the trust and confidence in the clinic and the clinician who will carry out your treatment. Never be afraid to ask the clinicians background, experience and commitment. Armed with the above information it should be possible for individuals to assess the effectiveness and the possibility of side effects of each system as well as making sense of the advertising hype. 1.) Chromos 694 Pulsed Ruby Laser 1.) Chromos 694 Pulsed Ruby Laser 1.) Chromos 694 Pulsed Ruby Laser 1.) Chromos 694 Pulsed Ruby Laser 1.) Chromos 694 Pulsed Ruby Laser 1.) Chromos 694 Pulsed Ruby Laser 1.) Chromos 694 Pulsed Ruby Laser 1.) Chromos 694 Pulsed Ruby Laser 1.) Chromos 694 Pulsed Ruby Laser 1.) Chromos 694 Pulsed Ruby Laser 1.) Chromos 694 Pulsed Ruby Laser 1.) Chromos 694 Pulsed Ruby Laser 1.) Chromos 694 Pulsed Ruby Laser 1.) Chromos 694 Pulsed Ruby Laser 1.) Chromos 694 Pulsed Ruby Laser 1.) Chromos 694 Pulsed Ruby Laser 1.) Chromos 694 Pulsed Ruby Laser 1.) Chromos 694 Pulsed Ruby Laser.-Manufacturers - S.L.S. Biophile, Swansea, Wales. Wavelength - 694 nm - This wavelength is highly absorbed in melanin and minimally in the surrounding tissue and blood, this enables heating of the hair shaft and thus the follicle without absorption in the surrounding tissue. Pulse Duration - 1 millisecond. Energy - 0-20 J. Cm2. Clinical Outcome - clinical data on the Chromos 694 shows an average of 60% reduction of hair density, measured 4-6 months after a single treatment (it must be noted that approx. 7-10 treatments are recommended and the figures cover a wide range of hair colours working on an average of 12 J.cm2). Transient pigmentary changes are seen in 3.2 % of patients and all resolve naturally after 3 months. Reported incidents of scarring are zero. Pulse Duration - 3 milliseconds - this system overcomes the problem of a long pulse length by using cooled handpiece in contact with the surface of the skin. This helps to reduce the temperature rise but also means that more energy is required to get the correct temperature rise to kill the follicle. Energy - 0-40 J cm2. Clinical Outcome - clinical data for the Epilaser is sketchy and appears to be highly dependent on the operator. 3.) Long Pulse 3.) Long Pulse Alexandrite Alexandrite -Manufacturers - ESC Medical, Halfa, Israel. Wavelength - 755 nm. This wavelength has less absorption in melanin and high absorption in blood, this means more energy has to be used. This high energy coupled with the blood absorption means that the procedure becomes extremely painful and there is a high risk of burning the skin. Clinical Outcome - data shows a 40 % reduction in hair density after 4-6 months and 1 treatment. As a result of its long wavelength and pulse duration there is a very high risk of burning and requires significant operators skill to achieve the correct clinical outcome without any side effects. 4.) Epilight White Light System.-Manufacturers - ESC Medical, Halfa, Israel. Wavelength - 590- 1100 nm - all wavelengths between 590 -1100 nm simultaneously (and as such is a white light system and not a laser). This means that the system is not specifically targeting the hair but heating the entire area. This means a greater risk of non- specific burns to the treated area. Also wavelengths above 900 nm start to absorbed in water of which tissue is composed, which again increases the risk of burning. Pulse Duration - 3 milliseconds. Clinical outcome - little published data. Wavelength - Nd: Yag Laser - 1064 nm - this wavelength is not highly absorbed in melanin but the protocol uses carbon paste applied to the skin in order to absorb the laser light. Pulse Duration - 40 n Sec - extremely short pulse duration. Clinical Outcome - Whilst these systems produce very little skin reaction, clinical studies have reported a 40% incidence of infected hair follicles following carbon assisted laser treatment and concern has been expressed that the carbon particles were taken up by the lymphatic system. (1). These systems also have far less impact on the hair growth and actually aim " not to kill the hair follicle but to disable it "(2) and brochures state " impairs the growth of your hair over time, so that it regrows both slower and finer. It will be necessary to come in for treatment several times a year"
This is a hair management system where the hair regrows. (1) C. Nanni M.D. Tina Alster M.D. Washington Institute of Dermatological Laser Surgery. (2) Thermo Lase Corporation " Softlight ". All of the above technologies have similar limitations. The primary is being the inability to effectively treat darker skin types. This is because the skin around the follicle and the target hair shaft contain similar quantities of melanin, so whilst trying to heat the hair shaft the skin is being heated to a similar extent, increasing the risk of side effects. All of these lasers also have an inability to effectively remove grey hair. This is because grey hair has no melanin to absorb the laser light. Chris Hart runs the Cristianos Laser Clinic in Altrincham, Cheshire. Plus a new clinic in London -The London Institute, 10 Warwick Road Lon don SW5 9UH) and now one in Leeds. The above information was provided by Chris Hart at the Christianos Laser Clinic. The information below is from a different source, Mr. Tony Campion. Diode Lasers: Diode lasers can be designed at different wavelengths and the one best suited to hair removal is 810nm. This wavelength is well absorbed by melanin and minimally absorbed by blood so its action upon hair follicles is similar to that of the ruby laser. Melanin absorbtion is, however, less than that of the ruby laser and so there is less skin reaction when treating darker skins. A cooled handpiece is also used at treatment time. Four or five treatments are recommended but this data refers to hair removal from sites not subject to male pattern hair growth. Male pattern hair growth in men can include a very dense and thick hair structures. When treated, many follicles will be in the shadow of others and this reduces the effectiveness of treatment and more applications are necessary. Low power diode lasers are less effective and only high power diodes capable of delivering 40J/cm2 or more should be used. Treatment probes up to 14mm diameter are used and they reduce the time taken to treat backs or legs. Suitable lasers include the LightSheer made by Coherent and the MeDioStar made by Asclepion-Meditec AG. Nd:YAG lasers have acceptable results on coloured skins without pain and many do not need or recommend carbon paste or skin cooling prior to use. There are a number of variable results reported from the use of many lasers and light sources for hair removal. A number of factors that come into play for effective treatment including the cyclical nature of hair growth. The laser sensitive anagen phase varies according to hair location on the body and successful treatment does depend upon the skill of the laser operator in understanding the parameters and capabilities of the laser in use, the hair type and skin colour. The Northern Concord is a completely voluntary organisation and has no commercial ties whatsoever.